Internet marketing is what you need to start increasing your sales figures. Given that more and more businesses by the day are flocking to the Internet to broaden their customer base, it’s all the more important that anyone who is planning on having any type of business on the Internet to plan a well thought-out Internet marketing campaign. If you’re just getting started, this may seem a bit overwhelming. After all, when it comes tomarketing on the web, there are a ton of different choices you can make on how to run your campaign. We’ve listed some of the more effective ways for internet marketing below, but we must stress that not every business is the same. You need to monitor and keep track of how well the campaign’s doing and adjust accordingly. Using a tool like Google Analytics and GetClicky will help you keep track of a number of different things that will help you determine the success of your internet marketing campaign. Time and time again video marketing has shown that it will help you increase your conversion rates. But even if you aren’t selling anything on your website, having videos will help build trust with your visitors and regular followers. People also tend to prefer watching a video over reading text, so you can get your message out faster and reach a broader audience. When people start up a blog, they see themselves as a professional when it comes to whatever niche they are blogging about. But it’s not only you who sees you as a professional. Other people who visit your blog will come to see you as an expert in your niche topic as well. People trust experts, so if you make suggestions that they view, check out or even eventually purchase an item that you recommend, they will be more likely to do so. WordPress is built for bloggers. Blogs are also a great way to direct people to other sites related to your business, such as the company website and to your social media websites, like Facebook and Twitter. Just make sure that you update your blog regularly with fresh content (there should be a new post at least 3-5 days a week). If you start to run a bit dry on content, ask someone to guest blog on your site and you can guest blog on theirs. There is a mutual benefit in this. The host will get fresh content, and the guest blogger will receive a backlink from the host, thus giving them an SEO boost. Pay per click has been around longer than most of these other marketing strategies. It’s still incredibly relevant in that it helps create awareness about your company, product or service, and it does produce high quality, targeted leads. When you start with a pay per click campaign, you want to keep your target audience in mind. What do they like? What is their age demographic? Use jargon and images that you think would appeal to your target market. Pay per click is also highly valuable in that it will help you determine which keywords bring in the most traffic to your site. Not sure which keywords are worth using? Don’t take a guess at it. Use tools like the Google Keyword tool to help figure it out. And as always, monitor, monitor, monitor! Keep track of how successful or unsuccessful your campaign is. Be prepared to change it up from time to time. There are a lot of things you can measure about you social media efforts. I have compiled a list of 48 KPIs (key performance indicators) that you can consider for you specific activities. One thing to remember is that you should set at least some metrics that indicate if you are turning profit. Otherwise you can reach your KPIs and still loose money. Now, before you begin be sure to set the baseline. 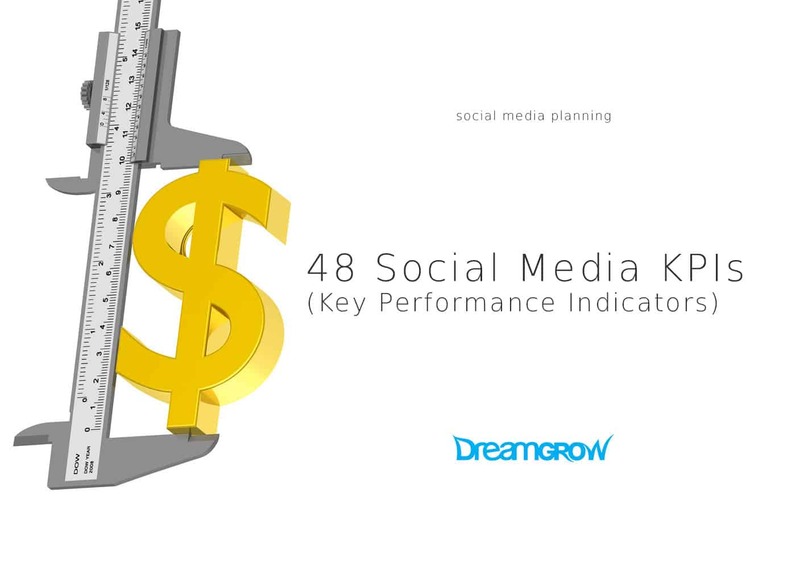 Look at the set of your chosen social media KPIs and and record the current value. These numbers are important but the rate of change is the main indicator for most of these metrics. For example it’s fantastic if you get 1000 followers in a day but not so if you get them over the year. Concentrate on the rate of change of your chosen key performance indicators. This can be also expressed as a frequency of events. For example you could measure how many comments you get on Facebook per day, week or month. You can combine several KPIs into one that is more meaningful for you. Ratios, such as comments per blog post, retweets per followers, help you measure audience activity and engagement. What social media channels are you using, how can people reach you, are you visible? How likely are followers going to engage, spread your message and interact with eachother? How do attitudes change due to the social media activities? This is the branding value that should convert into sales. How many sales and other real world result do you get from social media? You can get most out of these social media metrics if you benchmark them against you competition. Whenever possible try to find out the competitor’s numbers and you get a better insight of your performance. If you have 3,141 followers on Twitter the the number is meaningless, but in context of your competitor having 2,718 you may get some insights. The heart of the inbound marketing is about attracting strangers from across the internet and nurturing them into delighted customers. The question becomes how do you attract these strangers, and then build the necessary credibility and trust that is essential to a long term business relationship? The answer is content. Content is all of its forms, e-books, white-papers, blogs, case studies, videos, and infographics are how organizations are capturing attention, building credibility, and eventually closing sales. In this blog post I would like examine how you can use specific types of content to positively influence the sales process at every level. Awareness Stage: In the awareness stage the prospect realizes that they have an issue that needs to be resolved. So they start researching to better understand and frame their problem. Consideration Stage: In the consideration stage the prospect has a clearly defined idea of the problem. Additionally, they have researched all of the potential solutions to the problem that they are facing. Decision Stage: This is where the buyer has evaluated all of the different solutions and now has to choose a vendor to help them solve their problem. Understanding the high level stages that your buyers go through allows you to better mapcontent to each one of these stages. Individuals that are working through a purchase decision will be looking for different types of content depending on where they are in their research process. In each stage the buyer will be looking for different types of information. So knowing the type of content to produce for the: awareness, consideration and decision stage is essential. As stated above, the awareness stage is when the prospect realizes that they have a problem. Additionally, this is when the prospect starts researching the issue that they are facing. This content helps to educate the prospect and brings context to the issue at hand. This higher level content will be important for things like: “top-of-the-funnel” lead generation, elevating the organization’s search engine rank, and increasing credibility within the industry. Once the prospect has a clearly articulated idea of the problem they are facing they move from the awareness stage to the consideration stage. At this point they are looking for content related to solutions. The prospect wants to understand their all of their options as it pertains to their issue. What are the different ways that they can go about handling their problem? Do they need to purchase software to find a resolution, do they need to hire someone in-house, or can they outsource to fix the problem? By producing this “middle-of-the-funnel” content we help further educate prospects on potential solutions. The final stage in the buyers journey is the decision stage. At this point in the buying cycle the prospect clearly understand all aspects of their problem, and potential solutions for helping them resolve their problem. It’s the decision stage where the prospect makes a determination on the right vendor to help them solve their problem. This content will help you posture your product or service against competitors. The shift in purchase behavior has mandated a shift in the way that organizations market and sell their products. Additionally, it has elevated the importance of content at every stage of the sales cycle. Smart organizations are taking time to clearly understand their buyers persona’s purchase process. Then they are mapping highly relevant and educational content to each stage of the process. So take time to build out resources for the awareness, consideration and decision stage. By doing this you allow thousands of prospects the ability to walk through the stages of the purchase process at a pace that is convenient for them. These educational resources will help you decrease the cost-per-lead, shorten the sales cycle times, and increase the conversation quality that your sales people have with prospects. So start creating great educational content for your business today, you will be amazed at the impact that it has on your bottom line. Smart marketers constantly tinker with their segmentation strategy, working tediously to ensure that the right message is reaching the right people at the right time. With the rise of so many platforms across the vast social media landscape, this has never been more important—or more challenging. The opportunity certainly is ripe for reaching new audiences, but to do so, you first need to understand where certain groups are clustering. To that end, as you work through your own social media segmentation strategy, we’ve taken a deep dive into the demographics of each of the major platforms. The goal is to empower you to better align your brand’s efforts with the social conversations that matter most, while making lasting, meaningful connections with core groups of brand loyalists. To get started, jump right to the data you need by clicking on any of the anchor links below. A note about our sources: Each section list where the information was pulled, but a special thanks goes to the folks at the Pew Research Center, whose social media study has proved invaluable. A great way to see exactly which demographic you should target on social is to look at the demographic makeup of your current follower-base. When you start a free trial of Sprout Social, we’ll start to pull in gender, age and location data from some of your social audiences. This data shows the types of people who currently follow you on social, which is a good indication of your ideal social audience. Pair your personal data with the demographic data we’ve compiled here to hone your brand’s social media segmentation strategy. With 1.44 billion monthly active users, Facebook is the market leader for social networking sites. Your brand undoubtedly has a presence there, but how can you be using it in new ways to reach different groups? Source: This data is based on the Pew report as well as the self-reported information from over 1 billion Facebook profiles of users over the age of 18 pulled from the Facebook Audience Insights Tool. There have been rumblings that Facebook is losing some traction among a younger audience, causing it to skew a bit older. While this trend may be true, Facebook’s youthful base remains strong. In fact, Facebook data shows that the 18–24 age range is still the biggest demographic using the site. Facebook also seems to skew more heavily toward women, with 77% of adult females on the site and 66% adult males. This is one of the most important statistics that companies should consider, since there’s not a huge advantage in creating a presence on a social network who only has users in countries you can’t service. 72% of adults living in the suburbs use Facebook. 71% of adults living in urban areas use Facebook. 69% of adults living in rural areas use Facebook. As Facebook was originally created for college students, it makes sense that adults who have graduated from college are the leading demographic. 74% of adults who went to college use Facebook. 70% of adults who graduated high school or less use Facebook. One important thing to consider is the income level of your various segment targets. For instance, luxury goods are more likely to resonate with higher income earners. 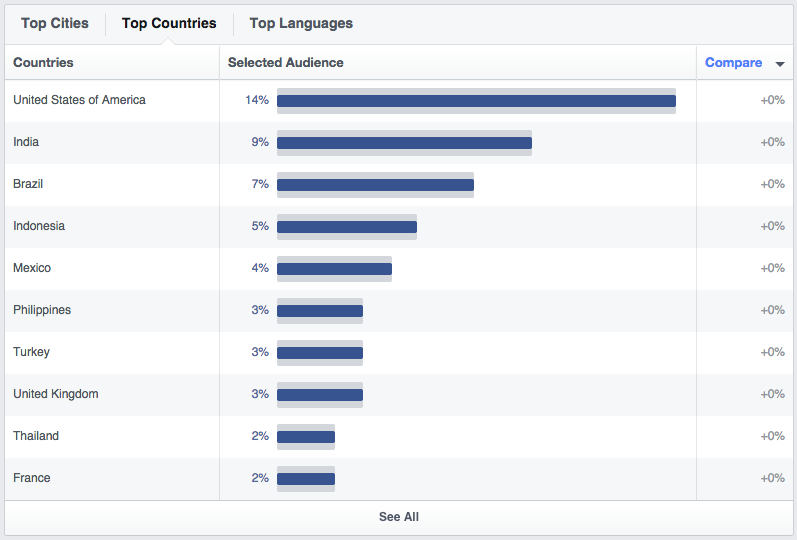 Facebook is unique in that it has a tool that allows you to play with audience data to find trends and statistics. For the rest of the networks, we turned to more external resources. Source: Twitter data is based off page 6 of the Pew Research Center Demographics of Key Social Networking Platforms study and information from Twitter’s About Page. 37% of adults 18–29 use Twitter. 25% of adults 30–49 use Twitter. 12% of adults 50–64 use Twitter. 10% of adults 65+ use Twitter. 24% of adult men use Twitter. 21% of adult women use Twitter. Based on this data, Twitter is a great place if your target audience skews toward a younger crowd. Moreover, for companies who do gender-based targeting, it should be noted that the number of male users has increased a good deal more than the number of female users over the previous year. 25% of adults in urban areas use Twitter. 23% of adults in suburban areas use Twitter. 17% of adults in rural areas use Twitter. 24% have some college experience. 16% are high school grads or less. The largest increase from 2013 to 2014 was among college graduates, which makes sense as Twitter seems to be moving toward a more business-friendly platform. Boasting a community of over 300 million users sharing over 60 million photos every day, Instagram is one of the rising stars of social media. The rapid growth in this user base makes it an increasingly popular network for brands. Let’s dive in to see if your target audience is on the site. Source: This data is based off page 7 of the Pew Research Center Demographics of Key Social Networking Platforms study. Also, of all of those age groups, the dominant gender on the photo-sharing site is female. This is the first network that we’ve tackled so far in this post that didn’t see college graduates as the top education demographic. It looks as though the majority of Instagram users are current college students, which should make finding pictures from your alma mater much easier. When it comes to the income of Instagram users, it seems to be in line with many of the other networks. The social media network for professionals has seen some massive growth since its official launch in May of 2003. 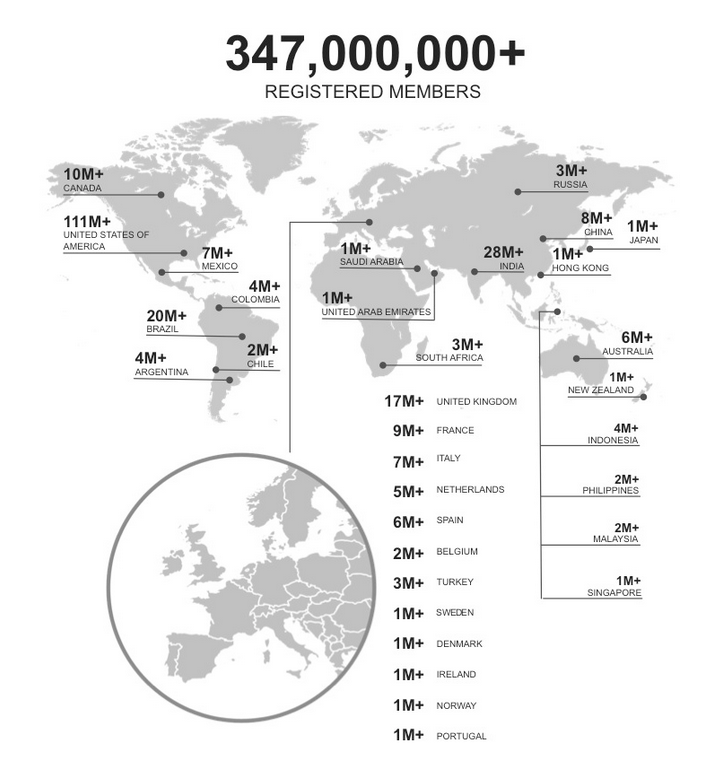 According to LinkedIn, there are more than 347 million members in over 200 countries and territories in its network. The higher average income of users and working mindset of the network make it an ideal social network for businesses. Source: This data is based off page 9 of the Pew Research Center Demographics of Key Social Networking Platforms study and from theLinkedIn Press Page. This is the first social network where the majority of users don’t fall between the 18–29 year old category. 31% of adults 30–49 use LinkedIn. 23% of adults 18–29 use LinkedIn. 21% of adults over 65 use LinkedIn. There is a pretty close divide when it comes to the different genders using LinkedIn. 28% of online men use LinkedIn. 32% of adults in urban areas use LinkedIn. 29% of adults in suburban areas use LinkedIn. 14% of adults in rural areas use LinkedIn. According to LinkedIn, the fastest growing demographics in its network are students and recent college graduates, making up over 39 million users. 50% of adult college graduates use LinkedIn. 12% of adults with high school or less experience use LinkedIn. Perhaps due to the higher education levels of the LinkedIn audience, there is also a higher level of users making a more sizable income. In recent years, Pinterest has become a fantastic resource for businesses. If you’re still unsure, just check out all of the success stories on the Pinterest for Business page. To see if the platform makes sense for your segmentation strategies, consider its demographic breakdown. Source: This data is based off page 8 of the Pew Research Center Demographics of Key Social Networking Platforms study. 42% of online women use Pinterest. 13% of online men use Pinterest. 17% of adults 65 and over use Pinterest. This is the first time in the demographic research that we’ve seen the rural market beat out both the urban and the suburban areas for share of users. 30% of adults in rural areas use Pinterest. 29% of adults in suburban areas use Pinterest. 25% of adults in urban areas use Pinterest. Like most of the social networks that we have addressed so far in this guide, Pinterest users are more likely to attend or have attended college. 32% of adult college graduates use Pinterest. 30% of adults with some college experience use Pinterest. 22% of adults with at least some high school experience use Pinterest. Pinterest users tend to have more disposable income. So if your product is more of a leisure good, this is a smart network for your brand. Demographics for Google+ are somewhat elusive. Even still, the site has great potential for SEO value, so if the information below doesn’t compel you to create a page, check out this article on why your brand should be active on Google+. Source: This information was pulled from a report from the websiteStatistic Brain. There’s not much information on the age of Google+ users, but the site has pulled in some statistics on gender distribution. 73.7% of Google+ users are male. 26.3% of Google+ users are female. Based on the size of this disparity, it’s likely that there has been a shift since the data was collected. The United States has the lion’s share of Google+ users. 55% of users are from the United States. 18% of users are from India. 6% of users are from Brazil. 5% of users are from the United Kingdom. 4% of users are from Canada. Snapchat is one of the newest social networks to hit the scene, but you wouldn’t know that based on the usage. Back in 2013, CEO Evan Spiegel said that Snapchat now shares 400 million snaps each day, a number that is sure to have increased in that time. Unfortunately, numbers on Snapchat demographics are slim. But we were able to find this tweet from BI Intelligence that succinctly summarizes some good data points. This section was written after the rest of the article so that we had a better idea of how each network sized up to the others. Let’s first take a look at the use of social media cross the entire online adult population. 58% of adults use Facebook. 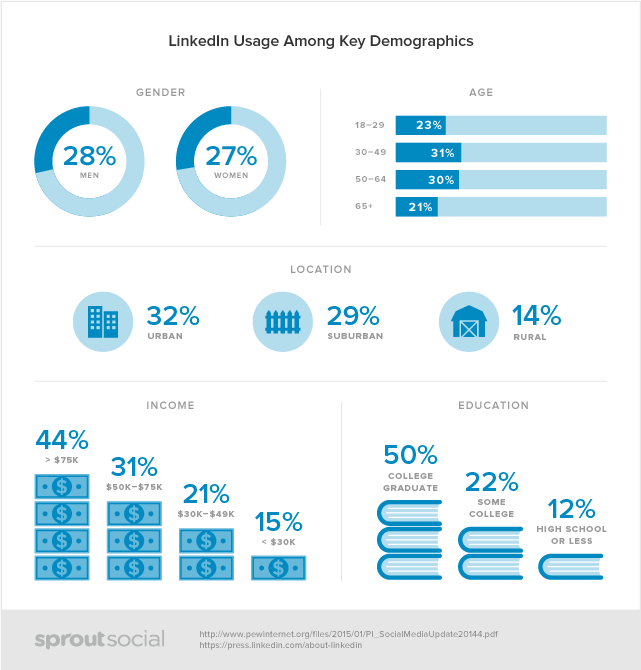 23% of adults use LinkedIn. 22% of adults use Pinterest. 21% of adults use Instagram. 19% of adults use Twitter. This is pretty telling that, no matter what you’re selling, you’re likely to find new audiences on Facebook. As for the rest of the networks, you’ll need to drill deeper into this data to see what is a good fit. It’s important to bear in mind that just because someone uses one network, doesn’t mean that they wont use another. In fact, more than ever, people are starting to use multiple social media networks instead of sticking to just one. 24% of adults are on two social sites. 16% of adults are on three social sites. 8% of adults are on four social sites. 4% of adults are on five social sites. Not only does the use of different social networks vary, but the frequency with which people use these networks varies as well. 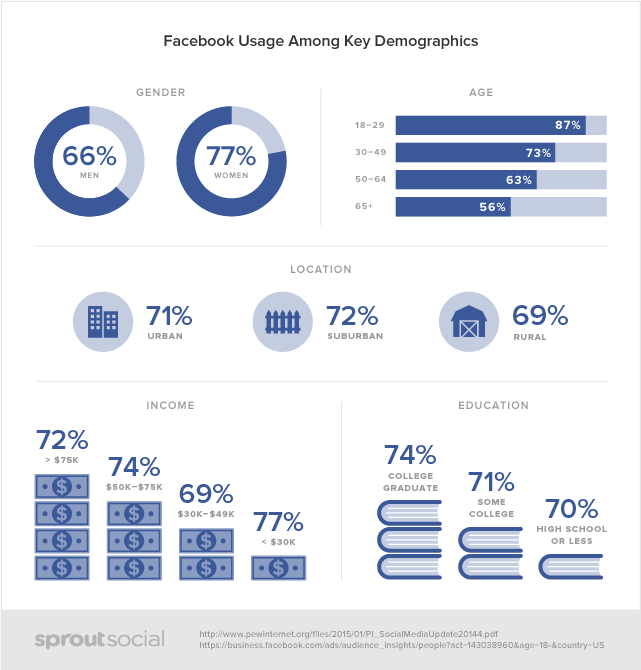 70% of adults use Facebook daily. 49% of adults use Instagram daily. 36% of adults use Twitter daily. 17% of adults use Pinterest daily. 13% of adults use LinkedIn daily. In a perfect world, your brand would create a presence on every single social network available and drill into segmentation further for each. Depending on your resources, that may not be feasible, so choose your networks wisely, and make the most of them once there. Is Audio The Next Big Thing In Digital Marketing? https://elementalstudios.us/wp-content/uploads/2016/09/audio_header.png 491 817 Jeff Beaty https://elementalstudios.us/wp-content/uploads/2016/09/logo_es_nav-1.png Jeff Beaty2016-09-14 13:47:022016-09-14 13:47:02Is Audio The Next Big Thing In Digital Marketing? Choosing a full service web design company means you have access to a variety of business services through one resource. This makes your professional presentation more affordable and consistent. Consider 8 reasons why you should choose a web designer who does everything you need. Trying to create a website on your own is difficult and has a novice appearance. Few people want to work with an amateur. Superior website design gives your business a high profile look. A professional web designer can build traditional HTML websites and flash websites as well as CMS based designs. They also create ecommerce sites that are reliable and function for people who conduct sales online. More people are searching for local businesses on their iPhones and Android devices. 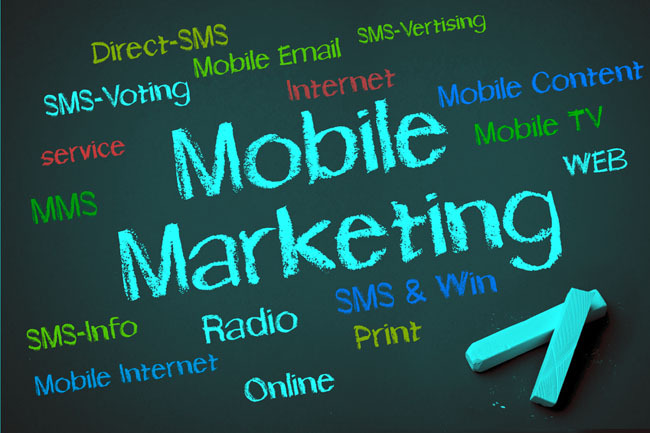 Capture this business by having custom mobile apps and a mobile web design. Your site will look good on these smaller devices so people choose your offerings over the local competition. The content on your website should be updated so it continues to appear fresh to the leading search engines. While you are busy taking care of business, a dedicated web design company takes care of web maintenance. They will update, edit or modify your web content on a schedule. Do it quarterly, monthly or weekly depending on your goals and budget. 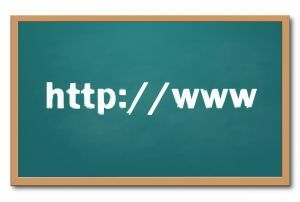 A business is much stronger when they have a memorable domain name that reflects what they do.Reliable website hosting ensures your site is available whenever customers want to access it. 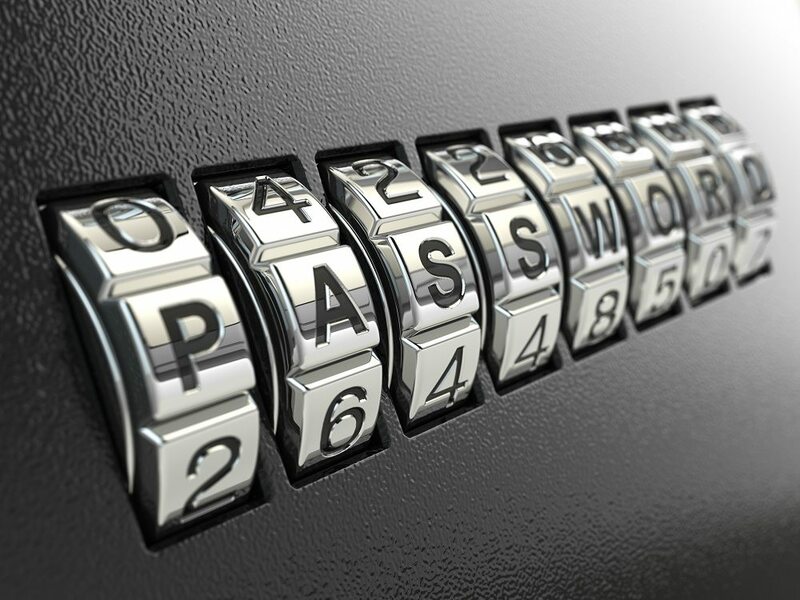 Take advantage of SSL, secure hosting solutions to make customers feel comfortable at your website. As your business grows, your website should grow with it. While a simple site might work for a fledgling enterprise, larger businesses need more. Let a web developer enhance your ecommerce area and overhaul your website to accommodate a growing number of visitors. A great website mean very little if people can’t find it. Online marketing is tricky and the rules are always changing. Trying to do it on your own can lead to more harm than good. Let a marketing expert add Google Adwords and Pay-Per-Click Advertising to monetize your website or blog. They will also ensure your content is search engine optimized (SEO) so your site moves up the major search engines over time. Nobody wants to lose important data online. Now that you have a thriving website, let a web developer handle online data backup. Take advantage of unlimited data back up done in real time so you don’t lose anything. Best of all, you can only pay for the space you actually use. Hiring a full service web design company is an investment in your future success. A website without a strategy is just taking up space. Let a web designer create a site that does it work to attract customers and keep them coming back for more. As your business grows, make sure your website continues to evolve with it.